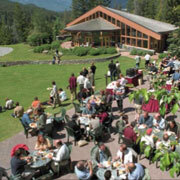 Over 180 audio engineers from around the world came to The Banff Centre in June 2003 to share the latest developments in multichannel surround audio. Together with a hard-working committee, Theresa Leonard, The Banff Centre's Director of Audio, and chair of the conference created a program that was packed from morning until night with technical papers, seminars, demonstrations, and panel discussions. Complementing this was a program of receptions and cultural events in the evenings, exposing delegates to the Banff Centre's exceptional culinary and artistic delights. 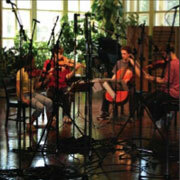 The 24th AES International Conference in Banff brought together audio engineering professionals, researchers, academics, and manufacturers for further discussions on the art, science, and future of multichannel audio. 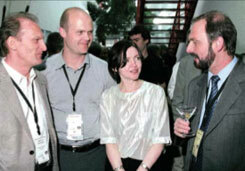 From left: Wieslaw Woszczyk, Morton Stove, Theresa Leonard, and Roger Furness.